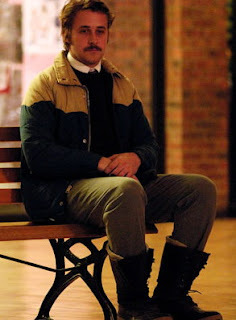 Ryan Gosling’s winning streak continues with his radiant performance as Lars Lindstrom in Craig Gillespie’s crowd-pleasing dramedy Lars and the Real Girl; an unconventional yet poignant love story. 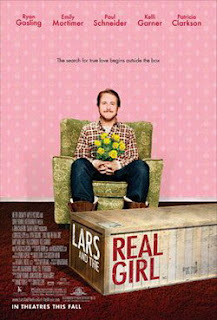 Lars is a kind, self-effacing young man whose development has been arrested by his mother’s death during childbirth. Abandoned by his older brother Gus (Paul Schneider)—who leaves home first chance he gets because he’s unable to shoulder his family’s sadness—Lars grows up strapped to his father’s heartbreak and never successfully transitions into manhood. After their father dies, Gus returns with his pregnant wife Karin (Emily Mortimer) and moves into the family house while Lars recedes to live in the garage, wary of human contact. It is Karin’s pregnancy that toggles repressed fears in Lars—he becomes concerned that something is going to happen to her—and his loneliness is heightened by watching how much Gus and Karin are in love. Lars seeks a solution through the Internet; he finds someone to love. The only catch is that the girl he finds to love—Bianca by name—is an “anatomically correct” love doll; made to order out of silicone. With traces of what made Jimmy Stewart such a beloved actor—Harvey springs instantly to mind—Ryan Gosling, supported by a consummate cast, delivers a nuanced performance that ranges from laugh outloud comedy through the film’s darker, difficult cadences as Lars individuates through Bianca, his transitional object, with the guidance of his compassionate physician Dagmar (Patricia Clarkson) and the support of a small town community that truly cares about him. Above all, the film succeeds for taking an outlandish premise and making it emotionally accessible and believable. By film’s end the audience has invested as much energy in Bianca as Lars’ neighbors and in the process discover feelings they didn’t know they had. Paul Schneider excels as Lars’ brother Gus, a fellow who has selfishly taken far too much for granted and is at wit’s end to cope with his brother’s dilemma. His comic turns are charismatically underplayed, the perfect straight foil to Gosling’s unsettling antics. Emily Mortimer provides a caring heart’s anchor. This is an emotional transformation that is a delight to behold. 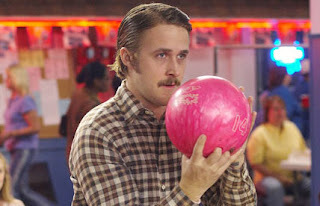 This was my favourite non-horror film at TIFF, thought it was really well played for what could have been a tricky subject matter and Ryan Gosling was superb. Thanks for swinging by Soulmining. After one too many depressing films at TIFF, Lars was refreshing for being funny. I've been enjoying your photo coverage of Toronto.